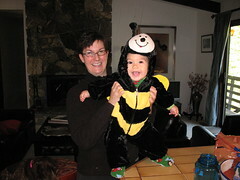 My busy bee and my queen bee. Crazy busy this past week. Students have come to my office almost every day of the week so I haven't gotten a lot of work done. Everyone seems to be worried about graduate schools these days. My truck's in the shop getting both fender's repaired. For now, I'm driving a sleek black Hyundai Sonata rental car with an auxiliary plug for my iPod and XM satellite radio. Insurance is paying for the car, so no worries. In other busy buzzness (yeah, lame), I'm trying to figure out the schedules for my various Midwest trips. On January 19th, I'll be reading in St. Louis for the River Styx Reading Series and I might be heading over to SIU Carbondale for a reading . . . it's still in the works. I'll also be going to AWP in Chicago from February 11th-15th where I've got two panels and a book signing. Then later, I'll be at the Whidbey Island Writers Association Conference from February 27th to March 1st. Finally, at the end of March, I'll be the Eddice B. Barber Visiting Writer at the University of Minnesota at Mankato. It should be fun! I may try to swing over to New York before the residency with Meredith and L.. Overall, I'm getting tired just thinking about my winter schedule and I'm worried that I'll be missing too many classes--not that my students would mind. Busy bees can have fun, though. I've been listening to Bruce Springsteen and Grampall Jookabox.